Tickets are on sale Wednesday. 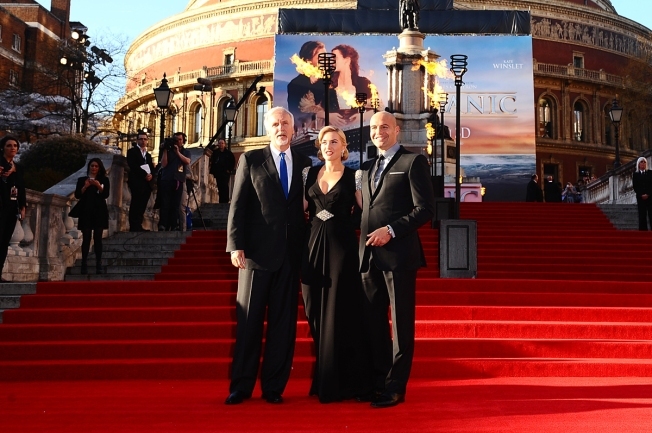 (From left) Titanic director James Cameron, Kate Winslet, who played Rose, and Billy Zane, who played Rose's fiance, arriving for the World Premiere of Titanic 3D, at the Royal Albert Hall, Prince Consort Rd, London. Twenty years after Leonardo DiCaprio and Kate Winslet fell in love on that doomed ship, "Titanic" is sailing back into theaters for one week. Cameron's "Titanic" grossed over $2 billion at the box office and won 11 Academy Awards including best picture and best director.